Before I embark on extolling the noble exploits of our PC's in the newly begun old-school game (you'll see what a joke the "noble exploits" comment is when we get to that point) I think offering some background to the campaign setting, house rules, and game world is in order. 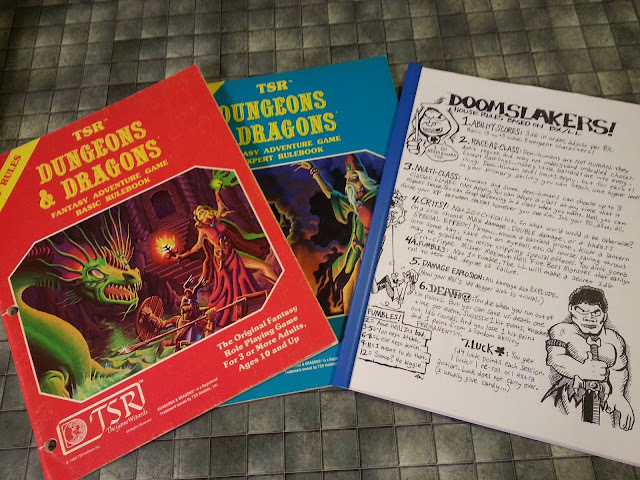 In terms of background, my overarching goal was to get back to my earliest days of gaming - and the days slightly before - when fantasy gaming was, in my mind, about expanding the imagination and exploring a world full of wonder and danger, not about making the imagination work within a set of game rules. As such, my campaign world is full of myth, wonder, and all sorts of strangeness - some of which may be understood (or at least explained in a rational-if-completely-incorrect manner) by its denizens, but most of which has no reason or explanation. The boundaries of the world and its true nature are wholly unknown, even to the oldest mortals; its history is shrouded in the mists of time and legend; its gods and goddesses are at once both alien and human, and are active particpants in the day-to-day affairs of mortals; each race has a creation myth that is part of the greater mythology of The Realm (as my game world is known, in a nod to my firstest and bestest MMORPG) except humans, who sailed to The Realm "from the west, somewhere beyond the Worldsedge Mountains". 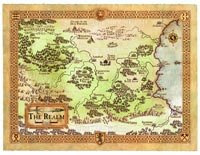 The greater portion of The Realm's population is human, with halflings being familiar but generally remaining in a single, small region; dwarves and elves are so rare as to be considered long-dead races or even mere legends by most humans. People who go about exploring long-abandoned tunnel systems, ruined castles, etc. (aka "adventurers") are considered dangerous by most common folk, as they consort with nefarious types, often wield strange powers, and generally behave in a manner that "just ain't normal." Most non-humanoid (meaning not human, dwarf, elf, or halfling) "monsters" are rare, and all are considered dangerous at best. Few have normal "monster ecologies," being creatures of unnatural creation. The goblinoid races fall under this rule, being "elemental forces, born from stone and damp and darkness." Dragons (who don't lay eggs) and demons (who aren't part of a pantheon with "angels") are the most powerful creatures (insofar as anybody in The Realm knows) since their creators shared with/imbued in them some of the most powerful syllables of the Tongue of Creation (the "language" that is the physical representation of all magic in The Realm). All giants (aside from hill giants) are believed to be the offspring of a god and a mortal, and as such are rare and "named" beings.